The species Ceanothus azureus, commonly known as Californian Lilac, is native to temperate regions of Mexico. 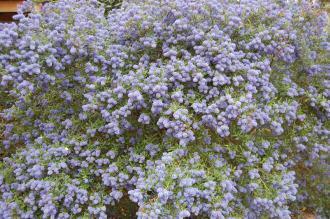 The variety Ceanothus azureus ‘Concha’ was found in a Welsh garden in Nantyderry. Ceanothus azureus ’Concha’ is synonymous with Ceanothus ‘Concha’. The etymological root of the binomial name Ceanothus is derived from the Greek word Keanothos which was applied by Theophrastus, a Greek Philosopher to an unknown plant. Azureus is from the Latin ‘blue’ (of Lapis Lazuli). 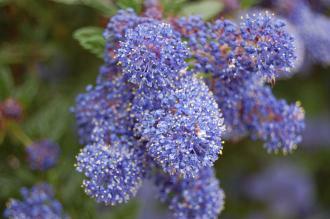 The landscape architect may find Ceanothus azureus ‘Concha’ useful as a robust evergreen fragrant flowering shrub. Once established this plant is drought tolerant. Ecologically, C. azureus ‘Concha’ is attractive to bees and other pollinating insects. The Royal Horticultural Society has given C. azureus ‘Concha’ their prestigious Award of Garden Merit in 2002. C. azureus ‘Concha’ prefers moist, fertile, well-drained soils. It prefers neutral to alkaline pH of soil, although it will tolerate most soils. Ceanothus azureus ’Concha’ requires little maintenance. Pruning should be carried out after flowering.